Liquid extracts cited in the numerous studies indicated selective cytotoxicities against several abnormal cell lines. The phytochemicals are derived from the leaf of this popular tropical fruit tree. Studies below point to its reputation and popular use by herbalists. Historical ethnobotanical use is said to be sedative and anti-spasmodic. Sometimes to treat, cleanse and support the liver, treat catarrh, and considered anthelmintic, antidiuretic, anti-asthmatic and digestive. Use 15-20 drops mixed with water two to three times daily, or more as recommended by a practitioner. Caution: Use under care/advice of a medical practitioner. Not intended for long term therapy. Should not bed used during pregnancy. It is recommended for people with low blood pressure, can have a hypotensive, vasodilator and cardio depressant action. May potentiate antihypertensive and cardiac depressant drugs. It may potentiate antidepressant drugs. People using antihypertensive drugs should monitor blood pressure and adjust medications if necessary. Do not use in combination with MAO inhibitors and some types of prescription antidepressatns. Long-term use may disrupt bacteria in the digestive tract. Can promote drowsiness. Reduce the amount used if feeling tired. Jasmine "This is really great"
This was just what the description said. I was very pleased with the product because it shipped out really fast. Couldn't ask for anything else. I have been using this for about 3 weeks because my breast are really sore. I decided to take this and this definitely helped soothe it. 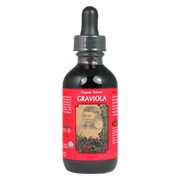 Organic Extract Graviola is shipped in a discrete, unmarked package. Orders are processed immediately and usually take about 3 to 5 working days to be received. We do ask that you try it for 2 to 3 weeks to feel the full effects. Any information received is used only for order processing and shipping purposes. Your information, such as e-mail address, will never be disclosed to a third party.